What is our Theme This Month:? We want YOU to create something that shows off YOUR Country. It can be in any medium but please remember to keep it family friendly. How to join our eBay Group:If you are interested in joining our eBay group you can simply email your eBay id to the above email list with a request to join our group. 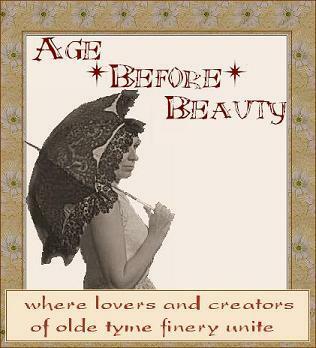 Charter for "Age *Before* Beauty"
This group was formed to create a friendly gathering of ideas, support, and information. It is meant to be a helpful tool for both buyers and sellers alike. Make sure to add your profile and siggies AND birthdays. There are lots of topics so come over and lets get to chatting. It is a great home where we can advertise all our business on eBay and off. We can help each other out with tutorials, free patterns and talking about how to advertise. We would love to have you join us! Don't forget to work on your Monthly Challenge for our Blog: Show off YOUR COUNTRY in a unique creation straight from your heart!